Three teenage Christian girls yesterday (15 Nov.) appeared in court in Babile, some 550km east of the Ethiopian capital Addis Ababa, charged with inciting religious violence. The girls, whose names were given as Eden, 15, Gifti, 14, and Mihiret, 14 – together with an older girl, named Deborah – were arrested in the mainly Muslim region, following the distribution of a Christian book apparently seeking to counter widely-circulated polemics by a well-known Islamic critic. In a brief hearing, the judge sentenced all four to one month in prison after asking the prosecutor to present evidence. World Watch Monitor learnt that the girls will be transferred to a larger prison in a town called Gelemiso to serve the sentence among common criminals, even though three of them are below the age of 18. The judge allowed for an appeal but it can only take place after their transfer. The girls’ families are said to be shocked by the verdict but have not decided yet if they will appeal. Local Muslims said the book was “an insult to Islam”, which led to an attack on a church and the arrest of the four teenagers, as reported by World Watch Monitor on 19 October. Ethiopia is a mainly Christian country, with areas of significant Muslim presence. According to World Watch List 2016, it ranks 18th of 50 countries in which it is most difficult to live as a Christian. Police have re-arrested an 18-year-old Ethiopian Christian woman only hours after she was released on bail. The woman, known as Deborah, was detained with three younger teenage girls for their part in handing out a book about Christianity in Babile, a town 550km from the capital, Addis Ababa. Local Muslims said the book was an insult to Islam, and this led to an attack on a church and the arrest of the four teenagers. It is not yet clear why Deborah was re-arrested. A police investigation failed to bring formal charges against her and the three other girls. Their bail application was approved by a judge, and the four teenagers were released after paying Birr 3,000 (about US$135). The prosecutor’s office is seeking advice on how to proceed with the case, sources said. 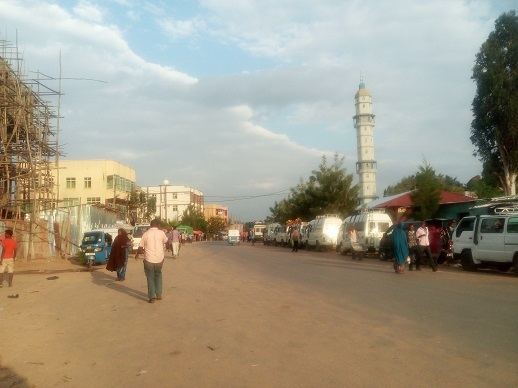 In Ethiopia, three teenage Christian girls have been arrested following the distribution of a Christian book in the town of Babile, about 550km east of the capital, Addis Ababa. Babile is close to the historic walled city of Harar, also known as the City of Saints, listed as a UNESCO World Heritage site for its Islamic cultural significance. The three girls – Eden, 15, Gifti, 14, and Mihiret, 14, first appeared in court on 28 September – with an 18-year-old woman known to her friends as Deborah. Police asked for 14 days to further investigate the case, but the judge awarded six days. On 3 October, the girls appeared in court again; the judge awarded officials a further three days to take the girls to a nearby town for medical examinations to determine their exact ages (they don’t have official dates of birth, and the age at which Ethiopia deems someone should be tried in an adult court is 18). The judge postponed the hearing to yesterday (10 October) without giving a reason; the case was then transferred to a higher court in Harar and their lawyers applied for bail. When the girls came to court in Harar, the prosecutor reportedly asked for more time to finalise his charges, so the judge adjourned until Friday 14 October. The case follows the distribution of a Christian book (in Ethiopia’s main Amharic language) by a local author, ‘Let’s speak the truth in love: Answers to questions by Ahmed Deedat’, that sets out to answer questions posed by the late South African Islamic scholar (and former head of the Islamic Propagation Centre International) about the Christian faith. Local Christians decided to distribute it following cross-cultural evangelism training. Local Muslims said the book was an insult to Islam and on 19 September a group attacked the Protestant Meserete Kristos Church (MKC) in Babile, damaging its doors and windows. MKC is a member of the Mennonite World Conference. Town officials quickly arranged a meeting between religious leaders the next day, at which leaders of both the MKC and also the Full Gospel Church (FGC) apparently apologised for the distribution of the book, from which they distanced themselves. Following the meeting, officials arrested a man called Bekele, as well as Deborah, Eden and Eden’s mother. At a wider public meeting the same day, town officials criticised “some elements” who wanted to “incite religious clashes” and warned that they would take further measures against such “instigators”. A local Christian who challenged this – by pointing out that Islamic books are in circulation in Babile, but that no similar action is taken – has since been required to report to the police regularly. He has been pressured to apologise for his statements, which he has refused to do. That night the FGC also suffered an attack, resulting in similar damage to that of the MKC. Threats against church leaders continued; the next day (21 September), a group of about 20 Muslim youths reportedly visited the house of the MKC leader and warned him to leave the area or risk losing his life and property. Officials released Eden’s mother on 21 Sep. and Bekele on 22 Sep., but arrested Gifti and Mihiret the next day. There is concern over the wellbeing of the girls; Eden suffered a beating on her first night in prison. But according to World Watch Monitor’s source, who was able to visit the girls in prison and speak to Eden and Deborah, their faith is unshaken. “This [suffering] is an honour for us. We should expect persecution. We are not afraid. We are singing and praying here in prison,” Eden said. Deborah added, “It is an honour to be jailed for God’s Kingdom”. Ethiopia says it guarantees freedom of religion* and in the cities there is mostly peaceful co-existence between people of different faiths. However, Evangelical Christians, (including those who formerly adhered to Islam or to the Orthodox Church) face discrimination, threats and sometimes attacks. Ethiopia is 18th of 50 countries in which it is most difficult to live as a Christian, according to the 2016 World Watch List compiled by Open Doors, which works worldwide with Christians under pressure for their faith. 1. Everyone shall have the right to freedom of thought, conscience and religion. This right shall include freedom to have or adopt a religion or belief of his choice, and freedom, either individually or in community with others and in public or in private, to manifest his religion or belief in worship, observance, practice and teaching. 2. No-one shall be subject to coercion by force or any other means, which would impair his freedom to have or to adopt a religion or belief of his choice. 3. Parents and legal guardians shall have the right, in accordance with their belief, to give their children religious or moral instruction. 4. Freedom to manifest one’s religion or beliefs may be subject only to such limitations as are prescribed by law and are necessary to protect public safety, order, health or morals or the fundamental rights and freedoms of others and to ensure the secular nature of the State.